The College Bridge Series is a multi-semester college bridge course designed around the requirements to successfully compete in the American Contract Bridge League "College Bowl" of tournament bridge. Participants must be between the ages of 17 and 25, and compete as teams in online trials with the top four teams eligible to compete for scholarships at the summer North American Bridge Championships (NABC). Semester 1 assumes no experience with card play, let alone bridge. Semester 2 brings students to modern team-based contract bridge competition using modern Standard American (SAYC+) techniques. Third semester transitions to the more current Two-Over-One (2/1) Game Force bidding system as it is found in play in the top flights of tournament play. In my opinion each of these semester long courses should be 3 Unit undergraduate electives. I've certainly loaded up the workload to that level. This fourth semester isn't a course at all. It's a template for creating "For Credit" college undergraduate and graduate classes, blending student primary academic major studies with the business side of the card game contract bridge. Experience with the material covered in the first three semesters, or the equivalent in real world experience is a prerequisite. Many of the modules are building blocks for others, so students should be able to take multiple parts for continued credit. 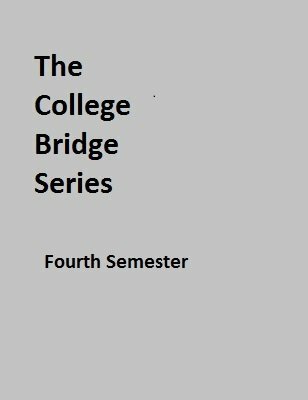 All lessons in the college bridge series are free to download, but students, instructors, and colleges must work out administrative details, tuition, fees, and payment (if any) to bridge teachers. It is hoped that many will be faculty members or will be allowed on as single-course paid adjunct faculty. As before our goal is to get a copy in EVERY college and university library and student activity reference center in the US and Canada! The material in this series is intended for use in the normal curriculum, not in "Lifelong Learning" or Senior Enrichment type experiences. Our target student age is 18 to 25. Lybrary.com is providing us space for this without compensation. If you like what we are doing here, BUY SOMETHING FROM LYBRARY! My books would be fine, but if not those then maybe Eddie Kantar's Forcing Pass ebook or anything else on magic, card tricks, chess, other games, or other fine offerings available from this domain.